Simply authentic! This rustic countryside villa is full of character offering a tranquil and romantic escape to couples longing for a truly Greek experience. The house overlooks the Ionian Sea and is nestled on the hillside of San Stefanos with tavernas, beaches and mini markets just a short drive away. The stone built property has a white-washed solid beam roof and fantastic pool area, which provides a warm welcome to everyone. This 1 bedroom, 1 bathroom villa includes air conditioning/heating in the bedroom and WiFi. Charming and full of character for a true, ultimate Greek experience! The kitchen door opens onto 2 small naturally shaded terraces with dining areas, both offering different sea view perspectives whilst overlooking the L shaped pool. The spacious pool area features a stone wall surrounding the property to provide privacy. There is also a stone built BBQ and views to the North East coast of the island. Please note that the swimming pool now has safety glass around one side, so as not to obscure the views. From a track and down 10 steps leads to this character, stone built villa for 2, where a solid arched wooden door leads into the house. To the right of the cosy open plan living space you will find a seating area and fully equipped kitchenette with a solid wood breakfast bar. To the left of the open plan living area you will find a metal framed double bed with bedside tables, an antique wardrobe and dresser. There is a window that overlooks the pool area and Ionian Sea. Central to the living space there is a shower room with a WC and basin. This villa is registered and licenced by EOT Greek licensing association. This number is: 0829K122K8265001. Villa Folitsa is set on the hillside between the bays of Kerasia and the upmarket resort of Agios Stefanos. Tavernas, beaches and mini markets are just a short drive away from the villa. 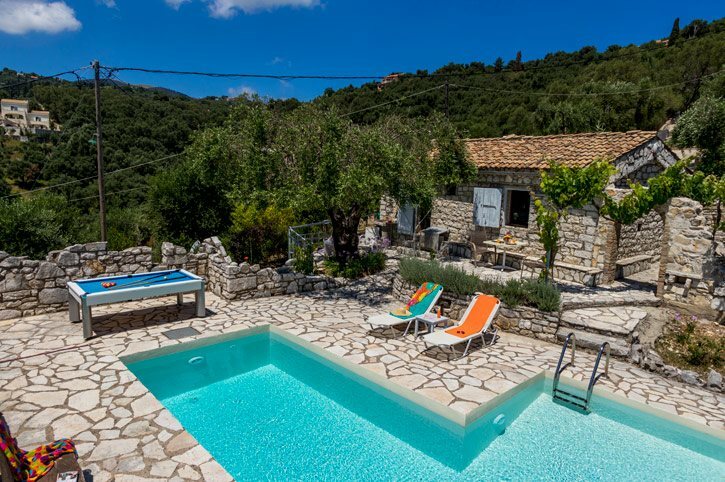 This property is perfectly nestled amongst tranquil olive groves and ideally located for people wanting to explore the stunning North East Coast of Corfu and its quaint coastal villages of Kouloura, Kalami and Kassiopi. The beautiful island capital is just over an hours sail away. There are 2 supermarkets in Agios Stefanos which have a good range of products. In the opposite direction going back to the main road, there is also a larger supermarket in Sinies. Fresh meat and fish can be bought or ordered from all 3 supermarkets. Agios Stefanos has a good selection of tavernas and small cafes along the seafront where you can watch the fishing boats come and go. Kerasia which is a further 3 minute drive away from Agios Stefanos has a taverna and café on the water front. The resort of Kassiopi is a 10 minute drive away, which has a wide range of tavernas, bars and cafes. The beaches of Avlaki, Kerasia and Agios Stefanos are all within 10 minute drive from Villa Folitsa. All of which are shingle and pebbles. A horse riding centre, dingy sailing and boat trips are all nearby. A small water park - Hydropolis is approximately 9 miles away from Villa Folitsa. This is situated on the outskirts of the resort of Acharavi. The bigger water park- Aqualand is situated in the centre of the Island in the village of Agios Giannis. This is approximately 22 miles away. For anyone wanting to experience a true taste of Greece, motor boats can be hired locally to explore the stunning bays of Kouloura, Kalami and Agni along the north east coast or alternatively there is a horse riding school offering treks through the beautiful countryside. There is a golf course, approximately 23 miles away, this is in the centre of the Island in the Ropa Valley near the village of Ermones. Old Peritheia Village is a unique village near the summit of Mount Pantokrator which offers hiking routes, stunning views and traditional tavernas to sample old Corfiot recipes. Villa Folitsa is not available to book for season as it is sold out. Take a look here at the Corfu villas that are currently on sale. The capital of the island and at one time of all the Ionian Islands, Corfu is a joy to discover. With its elegant arcades, narrow Venetian style streets and relaxed friendly atmosphere it is definitely a must for all. A historically strategic and heavily fortified town and port Corfu's history dates back centuries. Evidence of the original site of the ancient Greek city can be seen in the gardens of Mon Repos, the one time residence of the Greek royal family and in the Archaeological museum. Further evidence of Corfu's Historic past can be found simply wandering through the streets. You will come across little Byzantine churches, Italian platias, French arcades and a very British cricket pitch. A walk up either of the two dominating Venetian fortresses that still remain is well worth the effort for the panoramic views across the town, port and sea and for refreshment and shopping you are truly spoilt for choice with a wide range of shaded café bars, restaurants and shops open from early morning until late at night. A beautiful villa built in lovely grounds in 1831 by the British, Mon Repos later became the summer residence of the Greek royal family. Built in part on the site of the ancient city of Corcyra (Corfu) with extensive grounds leading down to the sea it is a wonderful place for a stroll out of the heat of the sun, the easy walkways being shaded by a wide variety of enormous trees. Some evidence of the ancient city walls and a small ancient temple can be found and there is small museum inside the original villa that shows the progress and some artifacts from the continuing excavations on the site. The evenings in Corfu town are a delight for families. A fun thing to do is to take the horse and trap for a small tour of the town. You will see them around Corfu Town and you should ascertain the cost before getting onboard. It is well worth the hour you spend holding up traffic. Alternatively, you may prefer to jump on the tiny train for a trip around town. The park and the Liston area is alive with families drinking coffee whilst their children play ball on the cricket pitch or ride on the small battery powered cars in the park. Lovely villa and fabulous holiday.